This has been in storage for years. Was never used. Torn up box and warped from storage. 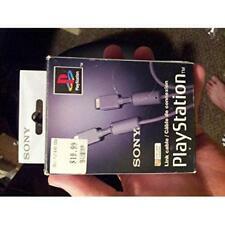 Sony Playstation system link cable in 6 foot length (1.8M). 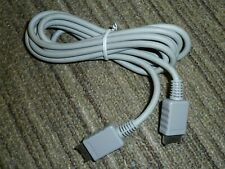 This cable is for the original gray playstation as they have a port to connect to these link cables. Connect 2 original model Playstation systems together for simultaneous competition. Like New Condition Link Cable PlayStation For PlayStation 1. Item Type: PlayStation 1. Platform: Sony PlayStation 1. Type: Link Cable. Color: Gray. Signs of wear can include aesthetic issues such as scratches, and discoloration. 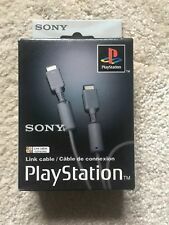 Playstation Ps1 Nyko Play Link System Link Cable. Shipped with USPS First Class Package. Comes in original box. Never used. Link Cable PlayStation For PlayStation 1 PS1 Gray SCPH-1040 Box opened/taped. Cable looks new and unused. Email if you have any questions and thanks for looking. Like New Condition Link Cable PlayStation For PlayStation 1. Item Type: PlayStation 1. Platform: Sony PlayStation 1. Type: Link Cable. Great condition with box (see pics). Detachable design. Our cable can function well no matter NTSC console or PAL console. Low Latency & Workable with Streaming Device. BEFORE BUYING AN ITEM, CHECK FOR REGION COMPATIBILITY. Lighting may hide certain defects such as tears, scratches, blemishes, dents, etc. We will try our best to properly detail condition using both PHOTOS AND TEXT. OFFICIAL Sony Playstation 1 (PS1) Link Cable OEM RARE! EXCELLENT condition. Cord has no frays. See pictures for more details. ● We have been around since 1994. We have an absolute passion for what we do, and its shows. 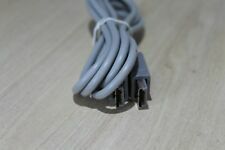 Link Cable PlayStation For PlayStation 1 PS1 Gray SCPH-1040 Mint 8E. Shipped with USPS First Class Package. Sony Playstation 2 Official HORI D-Link AV Stereo Gold Tip Cable JAPAN. This item is in very good condition. Peripheral cable for the PlayStation console. They areNEW SEALED, (UNTESTED). For more detail you can ask without problem and ask for pictures in case you need, not be left with the doubts. ======================================================. Mad Catz Universal RF Adapter. Super NES (SNES). Playstation 1 Link Cable. This is used to hook up two Playstation 1 units to each other for head to head play. Using this you can each play on a separate TV, which is a much cleaner play experience than using split-screen. If you did not receive our reply. Maximum Compatibility with Trending TVs on Market. Maximum Compatibility with Trending TVs on Market. We're happy to help. Sony Playstation 2 Official FUJIWORK D-Link AV Stereo Gold Tip Cable JAPAN. This item is in very good condition. Auf Funktion getestet. Siehe Foto. Guter Zustand. Leichte Gebrauchsspuren sind vorhanden. Exotische Spiele. Es wird automatisch. Spieleberater und Lösungsbücher. Wir sind Mitglied des Händlerbundes. Playstation 1 - Joy Tech - Console Linke Cable. Link Kabel ist neu. PLAYSTATION ONE CONSOLE LINK CABLE. A second hand grey Sony SCPH-1040 link cable that comes in the worn original box and is overall good condition. 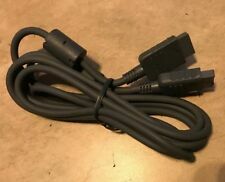 SONY PLAYSTATION 1 PS1 CONSOLE LINK UP CABLE LEAD ADAPTER CONNECTOR - BRAND NEW! In box but no instructions. Very good condition. Tested and working. Note that the cable needs powering via usb, but most modern TVs will have a USB slot to do so. Otherwise, you'll have to plug into a wall with adapter (not included). Imported from USA. PLAYSTATION ONE CONSOLE LINK CABLE. OFFICIAL & GENUINE SONY PRODUCT!